“Write what you know.” I’m a bit torn on this one. We all have to start somewhere; but if all you ever write is drawn solely from your personal experiences, you’re going to be as boring as that person on Facebook whose statuses consist entirely of “Ate some chips,” “Watching TV” and “Going to bed now.” So I’ll chalk this up as training wheels advice: great for getting started, but eventually you need to ditch it. “It’s not done until it’s perfect.” This declaration usually comes from my own head, not an external source. That makes it even more treacherous, as it’s far harder to escape. But as Voltaire said, “The perfect is the enemy of the good.” Your writing doesn’t have to be perfect, and striving for perfection will probably drive you mad. The real key to writing is recognizing when it’s good enough. “You really shouldn’t write until you’ve read ____ / studied ____ / gotten an MFA.” I know I need to read more Shakespeare. And when someone tells me they have an MFA, I congratulate them and smile and wonder if I’m effectively hiding my sudden terrifying inferiority. But to me, the most important thing I can do to improve my writing is just that: writing. Reading and studying are crucial, but they’re not a substitute for actually writing, revising, and honing your own work. You wouldn’t say, “Well, I’m not going to even start working out until I have the running shoes and lightweight workout clothes I want,” would you? No matter what equipment / training you have, your first few workouts / stories are going to be rough. But you can’t become a great writer without becoming an okay one first. “Why don’t you write something with vampires / wizards / zombies ? Everyone seems to love vampires / wizards / zombies right now.” As I do with vampires / wizards / zombies, I’m going to pretend whoever tells me this doesn’t even exist. Surely this isn’t the only less-than-helpful writing advice out there. What about you, loyal readers / writers? 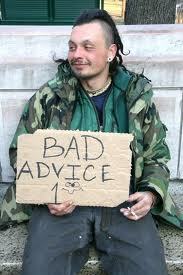 What awful advice has been handed to you? 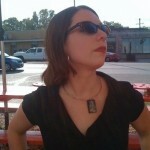 When she’s not revising her first trilogy of YA novels, hugging her rescued dogs, or playing “Rock Band” with her husband, Sarah Rodriguez Pratt writes for her blog ThatsAGirlsCar.com. She holds a Bachelor’s degree in English from Harvard University and a Master’s in Information Studies from UT-Austin. A native Texan, she grew up in McAllen but has called Austin home for over a decade. Yeah, that’s silly. Sure, it applies to some writers, but presenting it as universal? Refund, please. Someone telling me to push my manuscript through one of those online grammar-bot programs and then treat its word like holy writ. Uh, yeah. Somehow I don’t think having my novel sound like it was written by a computer is going to help my readers connect emotionally with my work. I’ve never heard of an online grammar check program, but I guess it’s not surprising. Sounds pretty soulless. And treating anything automated as “holy writ?” No, thank you. David, get out of my head! I was thinking of that exact same King quote and feeling miffed all over again. Sarah – The worst ‘advice’ I ever received was from a well-known poet who read my piece and, in lieu of commenting, emitted an, um, bodily sound. The tenor of his feedback was loud and clear. I dedicate my next fart to that guy, wherever he may be. Thanks for the comments and insights, everyone! I really appreciate it. And I may print out and tape Richard’s line “go & do whatever you want, just make it work” to my computer monitor as a motivation. I’m curious to hear more about grammar bots, only because I’d love to find another safety net protecting me from typos. Is it any more useful than Spell Check (which has failed me numerous times)? Spell check fails me by the time I type the second word. It’s fine with “David,” but then it underlines “Duhr.” Which makes me feel like I don’t exist. Which makes me wonder why I should bother to write. Which makes me turn off the computer and nap. Try writing a fantasy novel. Spell Check really hates it when you make up a word, even if you use it consistently. I love the “Add To Dictionary” feature that OpenOffice has (Word may have it as well). God help us if they ever print my “dictionary”. It’ll prevent you from seeing red all the damn time and allow you to add words that don’t actually exist. One of life’s small joys. Sarah, nice blog. I appreciate the bad advice. I’ve heard them all. You definitely nailed it with the write- something-about-vampires line. The one thing about writing is: there are more people offering advice successfully than publishing successfully. Write about what you know is deadly– and wrong. Why? We all know loneliness, fear, anger, brief moments of joy, of impetuous bad love that you go for anyway because, dammit, he’s slashing back tequila and so are you. The hard part is to write about what moves your characters — and your reader. The easy thing is type up: ‘Wow, great party” and post a picture of yourself dead drunk (not that I’ve ever done this)! Truly, from author of LIE. I was once told, by someone with credentials exceeding mine, that writers with “natural talent” rarely had to struggle in their production; this was a sign, he said, that someone was “born” to be a writer. Unfortunately, this weird cosmic formulation for what makes a writer a writer haunted me for years. Writing is a lonely task. Writing is, if its worth anything to the writer, a struggle. Love this post! I’m not a fan of write what you know, but I do believe in research so I guess in the end you would write what you know. I like writing for children and I hate when people say “that is a good market to be in. There is a lot of money in it.” I write for children becasue I like it not because of the market. Romance sells, but I’ll never write a romance novel.